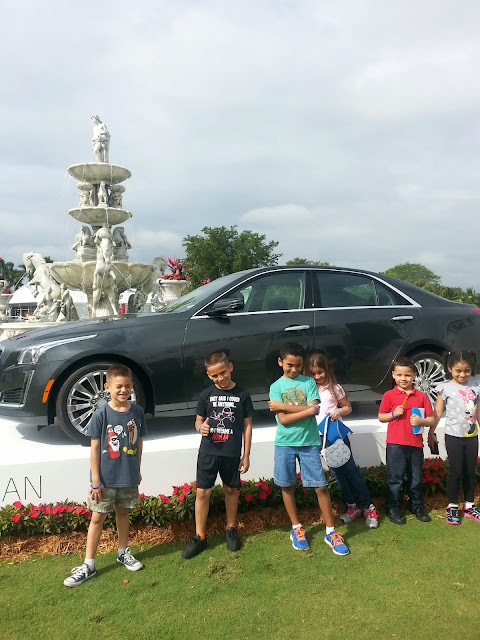 Imagination Playground, PGATour, Bloggin' Mamas and The Grands. Golf will never be the same. these are Babushka's impressions of the event. Mine and The Grands. Bueno, BB told you about the first part of the week in this post, now it’s the finde and things change a little bit. The weekend is time for familia, so when Babushka was asked to attend an event for children of course she thought of The Grands and said Si! You know BB lives for twofers, so if she can bring her loves to join in the career she loves, it’s a given! And then they told me it was for the PGA Cadillac Tournament at Trump National Doral. Que Quee??? Now, BB doesn’t know who’s idea it was to take children to a golf tournament, pero JU SO FONII!!! It’s not that they’re bad kids, it’s just that they’re Cuban kids. Especially Cuban kids related to Babushka! You know silence is not in their sangre. 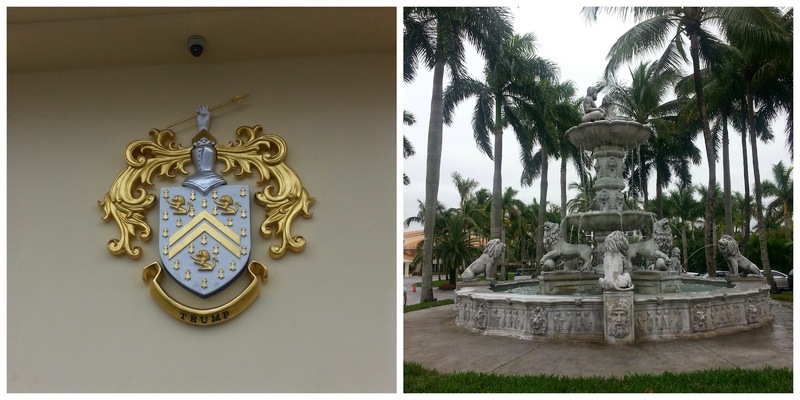 LLegando to the Trump National The Grands were impressed and realized the grandeur they were in. but they did realize the grandeur they were in. As we headed out to the grounds, the Bloggin' Mamas saw the open spaces, the grounds, and the Carlos Santana Sign, and were in awe. PicaPica (being BB's Grandson) saw what he wanted and went straight for it. He even stepped on the platform and went for the handle. The alarm was actually louder than he was. the children saw the playground and went straight to play. 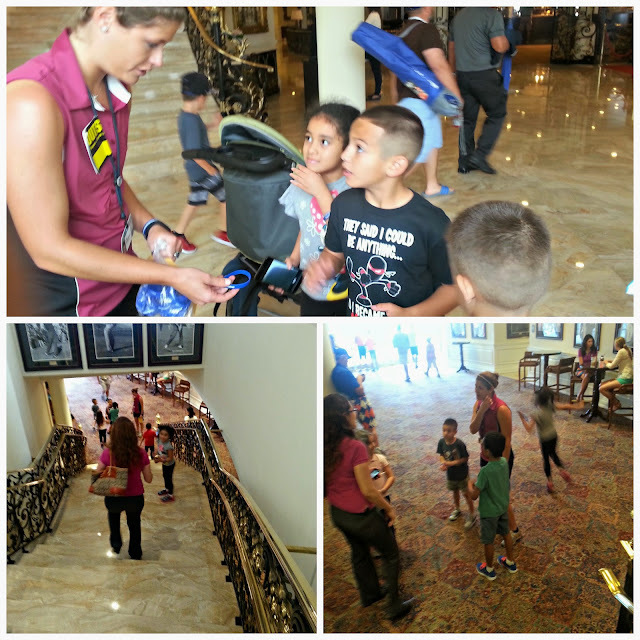 With no moving parts but the children themselves, The Grands had an incredible time. They planned,built, tore down, worked together, and by themselves. Even La Princesa knew what to do. 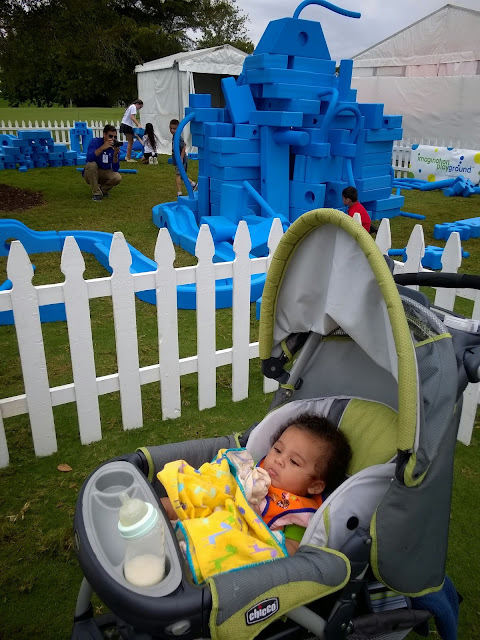 Autism aside, she was drawn to the "giant blue pillow blocks" and began making her kingdom. She even went to the structure of some older girls to go through their building. And then took the parts she wanted. Que puedo decir? There's a reason we call her La Princesa. Everyone of the children loved the Imagination Playground. Even the one who couldn't play on it. The idea is based on loose parts play - in our case kid sized big blue blocks - and child directed free play. All of this leads to purposeful play - the child loves stacking, connecting, and channeling with our blocks - and during play sessions the child learns collaboration, problem solving - improves fine and gross motor skills - and engages in deep play that exercises self expression and creativity - lots of fun and joy as children build and feel a sense of accomplishment. Second - our partnership with the PGA Tour and in this case The Honda Classic. 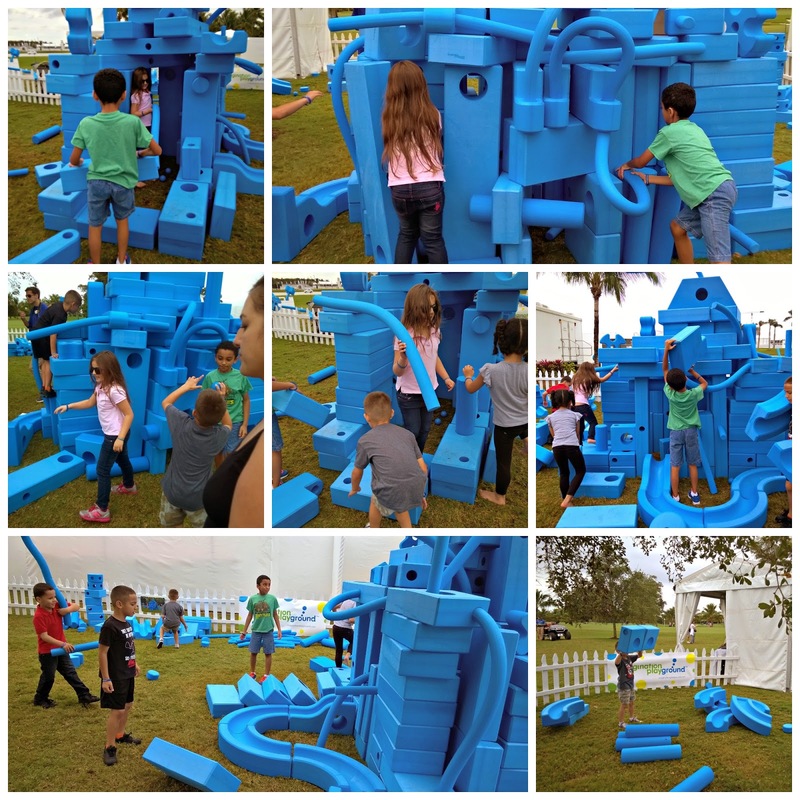 The PGA Tour approached us three quarters of a year ago with an opportunity to demonstrate Imagination Playground at a limited number of PGA Tour events in 2015 - in an effort to build out their Kids Zone play initiative. 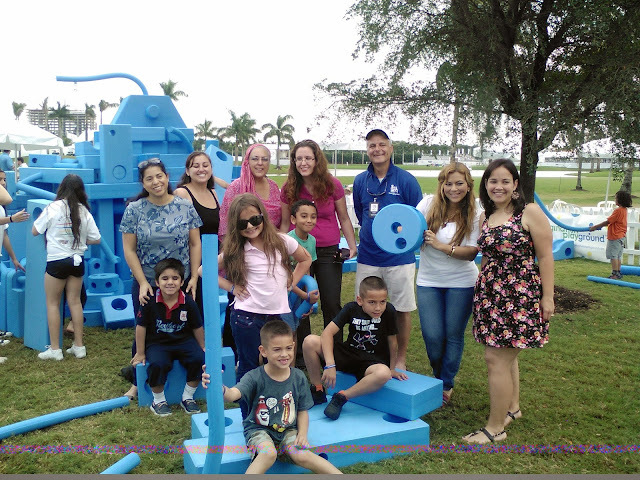 We knew Imagination Playground would delight the children and engage the families. We are pleased to be helping the PGA Tour and their events - and proud to possibly be included in their future plans. 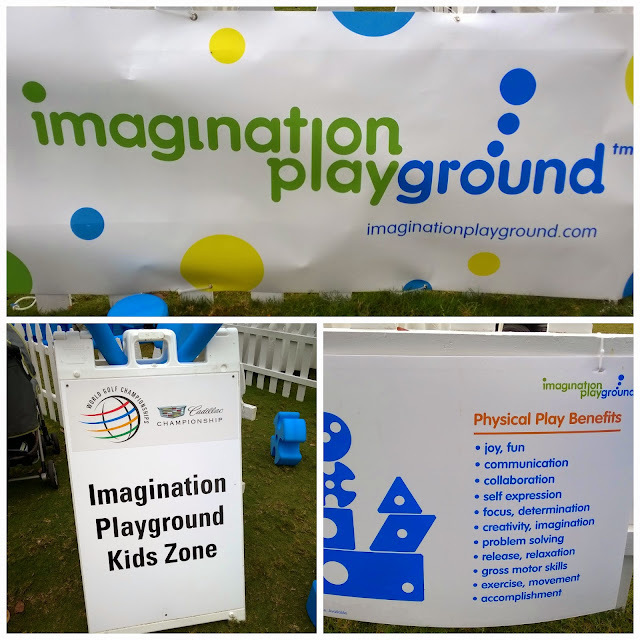 We respect the PGA Tour and their events because they raise so much money to help advance the work of local charities - many of which help families and children - just like us, Imagination Playground. No te lo dije? Nice guy, buena gente. Most importantly, he believes in his product, as well he should. The Grands were out there for 2 hours. Y querian mas, it wasn't enough! But it was enough for BB. It was nice to know children don't need gadgets with a million working parts, just the gadget of their imagination. The sign pictured above listing the physical building benefits? 100% true, cada punto. It was nice to see The Grands away from electronics, but let's be real, that is today's world. 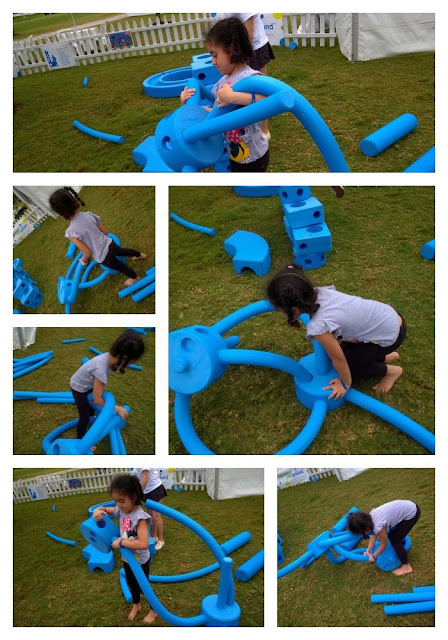 To this too the Imagination Playground has put their spin on an app, the Imagination Playground 3D Builder app. "Build with the principles of construction and engineering in the quick builder mode. Observe the effects of physics by turning on gravity mode and watch the Blocks take on their real life physical properties. Use the Blocks to understand proportion, geometry, and basic math principles—or just relax, create, and have fun." They've thought of it all, got it all covered. Mind, Body, and because they've left this Babushka so happy , my soul is there too. Honestamente, seeing The Grands enjoy themselves they way they did, made the world seem like a simpler place again. Entre the beauty of the grounds, the quiet of the event, and the smiles on our faces, this is one moment we'll relive happily again and again. go to their website and see how wonderful and affordable this kind of play can be. For this kind of fun and memories, Imagination Playground truly is priceless. they even knew of the Donald! See their impressions on her post.